Hi and welcome! I'm heading into the last day of my time off from work 😢but it's been a great break, so I'm thankful to have had it at all. I made this card yesterday, but had to wait for the Nuvo drops to dry before taking photos. I used the sketch and color challenge at MFT for this card. I hope you can see the sketch under all those layers! 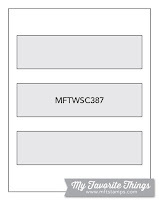 I had intentions of using a cover plate but I don't actually own a cover plate with three horizontal cut-outs (time to go shopping! ), so I comprised and used this Snow Drifts Cover Plate but added three horizontal panels underneath in the two blue shades from the color challenge (Sno Cone and Summer Splash). On the Sno Cone panel I stamped the sentiment from the latest card kit and, leaving the stamp in my Misti, I positioned the cover plate die-cut and re-stamped the sentiment. I then layered two cover plate die-cuts together and added them to the card. The flowers were stamped in various shades of the challenge colors and die-cut with the co-ordinating dies. I arranged each bouquet into a mirror image of each other and then added them to the card. Finally I finished with some Nuvo Crystal Drops in Morning Dew. 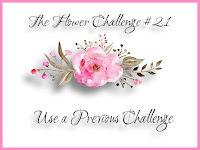 I'm also linking this up to The Flower Challenge, where you get to choose a previous challenge. I've chosen "Occasion" from their second challenge. Commenting to get email notifications of any other comments. This is such a me card! I am loving everything about it! I'm happy to know you've enjoyed your break, Karren … everyone needs that to refresh our batteries! This is the perfect example of that … fresh, bright, and beautiful! WOW! 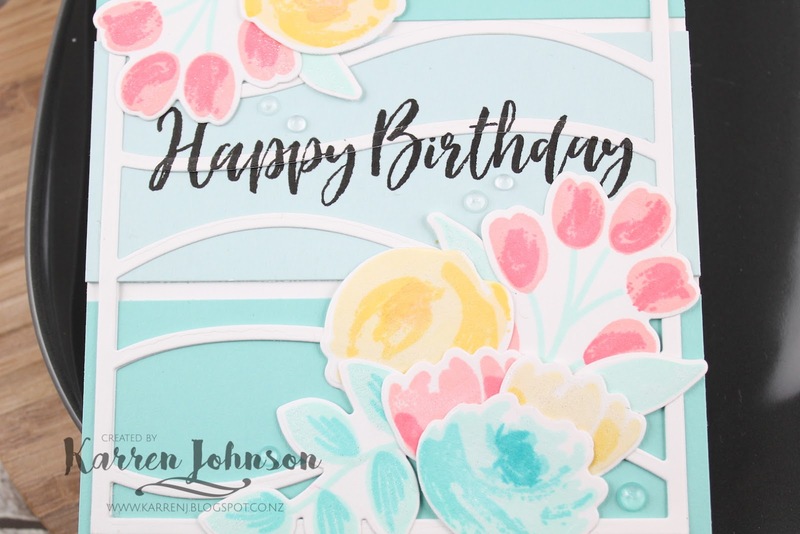 This is truly the MOST BEAUTIFUL card I have seen with this kit, Karren! Your color palette is gorgeous and I love how you layered your design with your cover plate...absolutely stunning work, my friend!!! I'm glad you had a nice break from work...you deserve it! A very pretty card, Karren. 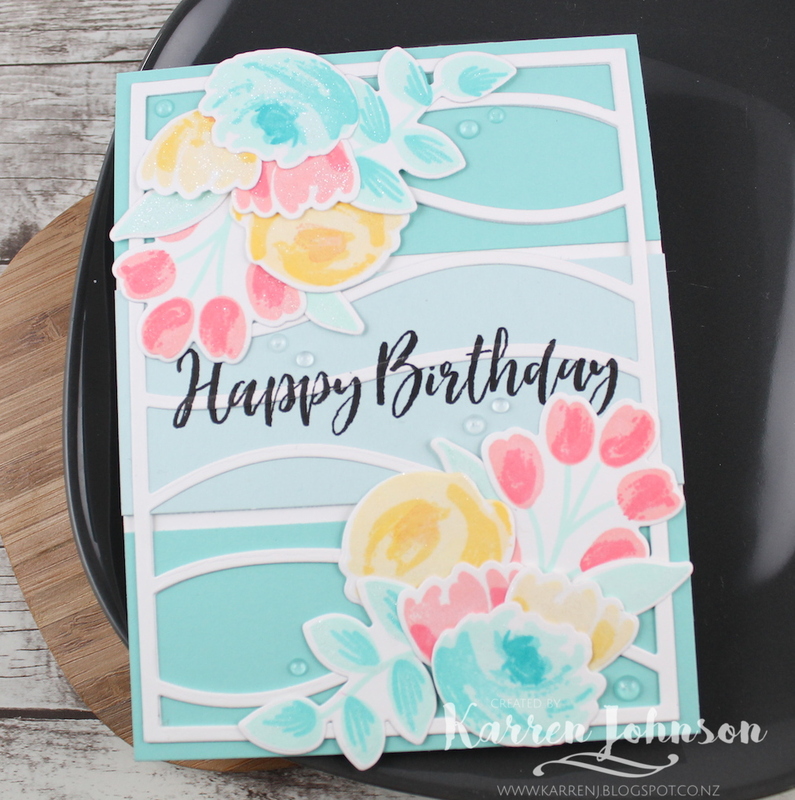 And I love your use of the cover plate die and horizontal strips for the sketch challenge, very clever!